Let your Lil' Lion roar. Halloween costumes have gone to the dogs, quite literally. According to a recent USA Today story pet costume sales are the industry’s fastest growing area. “Dogs are getting as many popular character licenses as kids,” a costume executive is quoted as saying. But all pet costumes are not created equal. That is where the Posh Puppy Boutique comes in. We sell more than 300 specialty costumes designed just for dogs and some cats, too. A key difference is our costumes, such as our Lil’ Lion ($25) come in a wide range of sizes designed to fit nearly any dog. This costume will show who is king with its three tones of brown medium plush plus a long mane and tail. Lil’ Lion is available in sizes from extra small to extra large, for example. Many of our costumes also come with sizing guidelines, showing pet owners how to ensure they have the right fit. Our costumes are also designed to look fabulous year-round, not just at Halloween. Our Sugar Plum Fairy ($25) made of purple satin with a shimmering petal skirt and featuring floral details around the waist also works at Christmas (think “The Nutcracker” ballet.) It comes in sizes from extra small to extra large. Our Super Soft Bunny Suit ($35) looks cute on Halloween then doubles as sleepwear for cold fall and winter nights. It comes on sizes from double extra small to extra large. Is your little girl a Sweetheart Sailor? We also pet costumes you will be hard pressed to find anywhere else. Are you looking for a Cutie Nurse, Rustic Pirate or Sweetheart Sailor outfit? 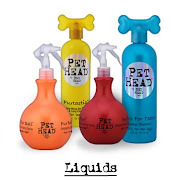 You can find all of them and many more at the Posh Puppy. All three of these outfits are $55 and all come in sizes from extra small to extra large with precise measuring instructions to ensure a perfect fit. Are you looking to dress your Chihuahua as a Taco ($25)? We’ve got you covered. Would you like something more stylish and unusual, like say an Authentic Nova Scotia Blue Tartan Scottish Kilt ($95)? We sell them in sizes from triple extra small to large. No matter how small—or how large—your four-legged friends are, the Posh Puppy Boutique is your first stop for Halloween costumes, dog-friendly treats and couture fashion outfits year-round. And sorry, but we don’t stock any Great Dane costumes. We also sell Halloween themed pet accessories, dog clothes and toys. Hay Chihuahua! They dressed me as a taco! Our Autumn Leaves shirt is perfect for the fall. Fall just recently arrived. Make sure your favorite pup is comfortably dressed for the season with a new sweater, jacket, dress or hair accessory from the Posh Puppy Boutique. Your small breed will look stunning in our handmade Autumn Leaves T-Shirt ($35). It’s perfect when the days are too warm for a sweater or coat but too cold to take your little one out unprotected. It features a leaf motif in shades of green and white sleeves. This outfit is pre-shrunk and pre-washed to remove any harmful chemicals. Sizes range from double extra small to small only. The Pumpkin Pup sweater works for the fall and Halloween. Consider our jack-o-lantern style Pumpkin Pup Sweater ($35), which is perfect as a Halloween costume and for everyday wear. Made with 100 percent acrylic fabric, they wash and dry easily. Several sizes are available. Show your fall fashion style by putting your princess in our Couture Halloween Pumpkin Dress ($75). Available in sizes from teacup (triple extra small) to medium, this dress features bright orange pumpkins and jack-o-lanterns on a black background. The dress is topped with a bright orange bow. It is available with and without a center “D” ring for safe and secure leash attachment. Another great, brightly colored fall dress that is perfect for any fancy occasion is our Couture Striped Halloween Dress ($75). It has diagonal stripes of orange, red, green, purple and black topped with a big purple bow. Available in sizes from teacup (triple extra small) to medium, it makes any dog look stunning. Let your dog’s inner animal roar with our Couture Halloween Wild Leopard Dress ($75). Featuring a green and yellow leopard print, this dress is highlighted by a wide black bow. It comes in sizes from teacup (triple extra small) to medium. Add a Halloween themed hair accessory to your pretty girl’s outfit. For example, we sell the Miss Witty Pink Bow Barrette ($22 for a set of two) from JoJo ™ Fall in Love Hair Bows. These barrettes feature a white skull on a pink bow. It is also available in black. There is also a Prince version in black and orange ($22). Check out all of these outfits by clicking here. We also sell Halloween themed pet accessories, dog clothes and toys. The Ribbon of Love Dress makes an appearance in Beverly Hills Chihuahua 3. Grab a bowl of popcorn—and a bigger bowl of dog biscuits—and enjoy some wholesome family entertainment with Papi, Chloe and the pups in Disney Entertainment’s “Beverly Hills Chihuahua 3.” The film is now available in Blu-Ray ™, DVD and Disney Digital formats. While you and your family enjoy the movie, look at the fashions. 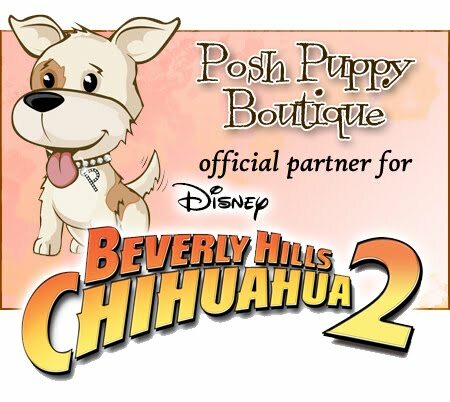 Many of the outfits, toys and accessories are available at the Posh Puppy Boutique. One example is this pink 100 percent silk Ribbon of Love Gown ($125), which is made for the three best friends in the Quinceanera. It comes with an attachable long evening skirt accentuated with a flower. Sizes range from extra small to large. The Lilly Pad Dress also makes an appearance in BHC 3. Our Lilly Pads Dress ($230) adds color, style and elegance to any occasion any time of year. Made with yellow and soft peach colors, it has organdy roses on an organdy silk background attached to a peach silk bodice. Sizes range from double extra small to large. Dress up any boy dog with a collar and tie like our White Dress Collar and Red Satin Necktie ($35). It easily attaches with Velcro and comes in sizes from extra small to double extra large. Add a touch of Mexico with our black and white polyester Dog Sombrero ($20), complete with adjustable chin straps. Your four-legged senor will look fabulous in it at Halloween, Cinco de Mayo and all year long. Fall is starting soon making it safer to take your pup on car rides. Keep their eyes moist and protected from the wind with a fashionable pair of ILS Doggles such as this pink pair for your little senorita. Made with interchangeable lenses, these goggles are designed just for dogs. They have comfortable back and chin straps plus frames designed for different size dogs. Sizes range from extra small to extra large. ILS Doggles also come in blue, silver skull and a host of other colors and styles. The Posh Puppy Boutique sells these and thousands of other couture fashion pet products both online and at our Rocklin, Calif. Retail Store. Watch carefully and you will see our logo shopping bag in this fun family film. Hip Doggie's Penguin costume comes in many sizes. Keep your favorite four-legged little friend warm while trick-or-treating this Halloween with a hooded costume from the Posh Puppy Boutique. Hip Doggie’s Penguin Hooded Costume ($30) comes in sizes from double extra small to extra large plus five additional widths. This warm fleece pullover-style costume is black and white with a red bowtie. Quack! Move quickly before we sell out of Hip Doggie’s Duck Hoodie Costume ($30). This bright yellow pullover style costume is washable and warm, making it perfect for colder fall days. We also sell Hip Doggie’s Giraffe Dog Costume ($30). This costume has an easy access front Velcro strap and drawstring hood. All three Hip Doggie costumes come in the same wide array of sizes. This Little Red Hood costume is perfect for your little girl dog. Discerning girl dogs would like something more feminine. For them we sell a Little Red Hood Costume ($58). It includes a petticoat dress with corset back, attached red hoodie and lace details. Sizes range from extra small to extra large. If you know a young human girl who has a girl dog, consider getting the dog a Girl Scout Dress costume ($70). Each dress is made by hand and made to order so no returns are accepted. Customize your dog’s dress with their favorite human’s troop number and add some fun patches! Sizes range from extra small to large. We have the perfect costume for any dog who’s nickname is Trouble: the Devil Bat ($35). In red with black horns and wings, this one piece hoodie comes in sizes from extra small to extra large. Does your dog like to do tricks or spend every waking minute playing? Consider dressing them up as a medieval court jester in our Joker Sweatshirt Costume ($45). This hooded black with red check design is made with 100 percent cotton. Sizes range from extra small to extra large. Get double duty with our Bear Attack Sweatshirt Hoodie ($40). The bear paw attack decal on the back is great for Halloween while the overall design makes this 100 percent cotton sleeved shirt great for any fall outing. Check out all of these costumes and hundreds more by clicking here. We also sell Halloween themed pet accessories, dog clothes and toys. Our Green Frog Costume is perfect for families with small children. Today is a great time to start shopping for your pet’s Halloween costume. Even though the holiday is six weeks away, the Posh Puppy Boutique’s broad selection of 300-plus dog and cat costumes frequently sells out early. Dress your dog in your favorite costume or one of our newest. Our Green Froggy Sweatshirt Costume ($45) is perfect for families with young children and friendly dogs. Available in sizes from extra small to extra large, it even has a center pocket to store doggy treats. This Bumble Bee outfit is one of our most popular costumes. Two of our most popular costumes for small dogs are our Bumble Bee ($34) in sizes down to double extra small and Hot Diggity Dog ($25) available in size, medium and large. The bright yellow with black stripes Bumble Bee costume includes a Velcro antenna “hat.” The Hot Diggity Dog costume has buns and your choice of ketchup or mustard on the back. For a more feminine look, consider our Bee Mine Costume, with wings and a yellow skirt. Sizes vary from extra small to extra large. Consider our Spellhound Witch costume ($25) for a more traditional look. It comes complete with matching witch’s hat, lace up back and plush broom toy. Sizes range from extra small to extra large. Our Charming Witch costume ($40) has a see-through black lace trimmed dress with matching hat highlighted by purple ribbon. Sizes range from extra small to extra large. Another costume with a traditional Halloween theme is our Black Ghost Sweater ($35) with a white ghost on a black background. Several sizes are available. We also have a much fancier costume that is perfect for smaller girl dogs: our Couture Ghost Halloween Dress ($60). It comes in sizes from teacup, which can fit some cats, to medium. This costume with its bright orange bow is available with and without a “D” ring for attaching a leash. Our Glow in the Dark Boo Dog Tank ($20) looks great in the daylight and when hit by a flashlight or a car’s headlights. Sizes range from double extra small extra large. Your dog can show their support for your favorite nation with a variety of patriotic clothing and accessories from the Posh Puppy Boutique. Sept. 11, 2001: We will never forget. Every dog will look great in our American Flag Sweater ($50) made with 100 percent hand-knit wool. Not only will your pup show their red, white and blue, but they will also be warmed by untreated wool treated with natural dyes. Sizes range from double extra small to triple extra large. This sweater is made from 100% natural wool. We also similar Patriotic Pup Sweaters ($45) in gray and navy, but these are made with acrylic fiber. Sizes range from 6-16 inches measured from the base of the neck to the base of the tail. Both feature an American flag. Bruce Springsteen fans can dress their little angel in our Born in the USA Tank Top ($30). In navy with red trim, this tank features a pair of angel wings letting your pooch honor the victims of 9/11 and all the men and women who have given their lives for our country. This tank, which is Made in the USA, comes in sizes from extra small to extra large. Another apolitical piece of apparel is our Peace Hat ($20) in red, white and blue. Stuffed fingers form a peace sign. An elastic band keeps the hat attached to your pet. Your little angel can be very patriotic. Yet another great option good for year-round wear is our Patriotic Adjustable Step-in Dog Harness ($45). Connecting with a single click latch, the double “D” ring design moves tension from a leash to your dog’s shoulders. Being adjustable, it can be worn “au natural” or over clothing. Sizes range from double extra small for dogs up to 4 pounds to large, for dogs weighing more than 35 pounds. Matching leashes are available for $38. Our Oh Beautiful Step-In Dog Harness ($45) also has a patriotic theme, but uses a different pattern. A matching leash is also available ($38). We also sell five soft mesh harnesses with different patriotic designs, all of which come in nine colors such as black, pink, orange and green. These harness designs are our Heart, Paws, bone and eagle with variations on the American flag, and the red, white and blue USAdesign at the shoulders ($30 each). All are available in sizes from small to extra large. Our Wind Parka comes in pink and yellow. Get your pets ready for fall and winter with fashionable and functional clothing from the Posh Puppy Boutique. Our pretty pink Wind Parka ($50) will keep your dog comfortable and keep those nasty cold winds from making him or her shiver. It is lightweight, waterproof and has a stowaway hood that can be tucked into the collar. A Velcro closure makes it easy to take on and off. Sizes range from extra small to extra large. This parka is also available in yellow. The Sadie Luxe Coat has a croc inspired outer covering. For even more style, take a look at our individually made—and custom fit to your dog’s measurements—Sadie Luxe Coat ($175). A soft, rich, croc inspired outer covers a faux fur lining that will keep your pet comfortable. These coats feature hook and loop neck and belly bands for an adjustable fit. Sizing depends on your dog’s measurements. In addition to being fashionable, they are also “PC” (politically correct) by being Made in the USA and having a portion of the proceeds going to help retired greyhounds. Molly and June have several lines of coats designed just for dogs. These coats feature vintage and contemporary designs. Each design is handmade in Canada of the finest materials. The Modern Classic Coat ($145), for example, has a white collar and back band with buttons. Made with water resistant faux leather and lined with 100 percent flannel, all seams and stitching is invisible. A Velcro bell band insures a secure fit. Sizes range from triple extra small to small only. Color choices include blue/brown, brown/blue, brown/pink and pink/brown. Molly and June’s Luxury Coat ($210) is made with a wool blend and adorned with rhinestones and pearl vintage style buttons or gray wool covered buttons then lined with 100 percent organic cotton twill. These impeccable coats have collars lined with faux fur for that added fashion statement. Sizes range from triple extra small to small only. Color choices include black and pink. For a more feminine look, consider Molly and June’s Petite Squares coat. It features a pink grid with brown squares and a contrasting collar. Sizes range from triple extra small to small only. Mochi & Jolie make several sweaters from 100% bamboo. Cooler temperatures are right around the corner and fall is not far away. Be prepared for a sudden cold snap by buying a pet sweater or two from the Posh Puppy Boutique. Among our newest arrivals are several knitwear sweaters made completely from a rapidly renewable and 100 percent biodegradable resource: bamboo. These Mochi & Jolie sweaters wear well, have natural antibacterial properties and provide UV protection. They are also cool and soft to the touch. The pink with darker pink ribbed cuffs and collar Love Gig Knitwear Sweater ($80), like all Mochi & Jolie sweaters, is designed for a snug fit. Available sizes range from extra small to large. Complete and accurate sizing information is available online. The Love Holly Knitwear Sweater ($80) features fine horizontal stripes of white and gray. Available sizes range from double extra small to large. The Love Leon Knitwear Sweater ($80) is turquoise, gold and black. Available sizes range from double extra small to large. The Love Luc Knitwear Sweater ($80) is light blue and black. Available sizes range from double extra small to large. In addition to bamboo sweaters, Mochi & Jolie also have several sweaters made in the USA from 100 percent European cashmere. Your dog can wear the same sweaters made with the same yarn as human products from fashion houses such as Prada, Gucci, Burberry, Hermes, Givenchy, Christian Dior and others. The Cashmere Luxury Sweater in Faye ($100) is solid pink with off-white ribbed cuffs and collar. The Cashmere Luxury Sweater in Deon ($100) is solid blue with off-white cuffs. Both are available in sizes from double extra small to large. The Snowflake Snuggler sweaters have a high-cut, stay-dry belly. Another great choice, available in pink or blue, is our Snowflake Snuggler Sweater ($28 each). Both features a diamond design trimmed with faux fur and a metallic embroidered snowflake. They also have a high-cut, stay-dry belly design. Sizes range from teacup to double extra large. Match your own fall outfits by dressing your dog in one of our Angora Cable Knit Sweaters in Sand or Chocolate ($45 each). These Hip Doggie hand-kit sweaters are made with Angora blend wool to be soft, comfortable and warm. Sizes range from double extra small to extra large. If you want sweaters in a variety of colors, consider our Cozy Cable Knit Dog Sweaters ($30 each). They come in charcoal, black and deep raspberry. These sweaters feature a ribbed turtleneck and hem plus leg straps for a comfortable and secure fit. Sizes range from teacup to double extra large.